Olive House sleeps 4 in great comfort. For parties of 6, The Apartment, located on the same Estate, is available free of charge with the rental of Olive House. Ground Floor: Luxury fitted kitchen, dining room and living room with see-through fireplace, double bedroom and full en-suite bathroom equipped with Jacuzzi bath. There is also a guest bathroom and small utility space with washing machine. First Floor: double bedroom and en-suite bathroom equipped with Jacuzzi bath. Olive House has its own mobile telephone, gas central heating, private garden, private pool (5mx 10m), patio, barbeque area and washing machine. It is equipped with Hi-Fi, HD flat-screen TV,SKY, VCR, DVD and laptop computer with WiFi connection for unlimited free internet access. The kitchen is equipped with gas hob, electric oven, dishwasher, fridge-freezer, toaster and coffee machine. Games room with pool/billiard/snooker table, table football, dartboard, stereo hi-fi and Wii. Golf just 40 minutes away on Antognolla golf course, an 18 hole Robert Trent Jones Jnr championship golf course with driving range, small club house, bar and changing facilities. Range of golf clubs, buggies and carts available for hire. Five bicycles of various sizes together with two child-seats. Archery Range on the estate. Laundry room with washing machine, dryer, ironing board. Maid Service, fresh linen, towels, beach towels weekly. Generous welcome food pack provided on arrival. Cots, highchair, booster chair, child stairgates, z-bed, books, games, dvd/videos available on request. We stayed at the wonderful Casa Vialba last summer and had the best family holiday we have had so far. We have 3 children aged between 16-11 years old and it is starting to become difficult to find a holiday that suits all of us but they all loved Casa Vialba. Julie and Carlo were the most generous, lovely hosts - they had even made us a delicious dinner on the first night even though we were several hours late and Julie had stocked our fridge in the Olive House. They were always there if we needed them but they also gave us the space to feel that the house and pool were ours for the 2 weeks we were there.The swimming pool is big and has lovely beds all around and inflatables for the kids. The Olive house is perfect for a family, the kitchen is well equipped and the beds are very comfortable. Our daughter stayed in the apartment and loved having her own space. We would love to come back one day with friends and take the other villa too. The games room was a cool and fantastic space to escape from the heat of the day and kept all our children occupied for hours. Everything about the holiday was perfect but it was the generosity, good humour and genuine warmth and care from Julie and Carlo that made it such a particularly fun, relaxing holiday. We would highly recommend this. We have stayed with Carlo and Julie at Vialba four times now, and cannot recommend it highly enough. This year (2016) we stayed in the smaller Olive House which is as tasteful and spotless now as it was when we first stayed over 10 years ago. The kitchen is well-equipped and everything in the house works well. The gardens and the estate are beautifully maintained, as are the pools, which are private for each of the two houses. The location is stunning. Vialba is in a valley which forms part of a national nature reserve. You can explore the valley on foot or on horseback, crossing or walking beside the river and meandering at will, virtually never seeing another person. It is perfect for walkers, runners and cyclists. At the same time it is not that far from the nearest small town which has gorgeous restaurants and views, and there are ridiculously pretty towns and villages scattered all around (as well as the usual more popular tourist destinations). If you want to stay put at Vialba though there is plenty to do there and Carlo and Julie will help to provide entertainment - swimming (of course), table tennis, pool, riding, quad-biking and archery. 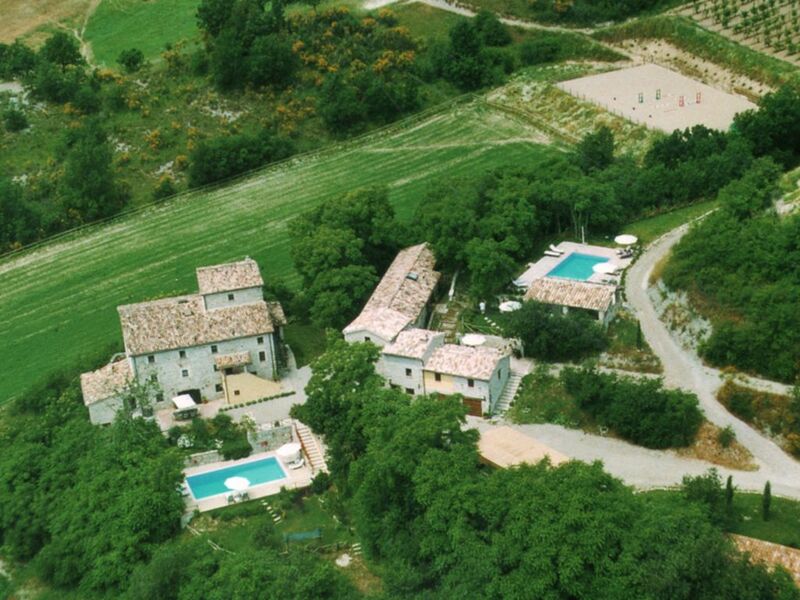 I highly recommend Vialba as a wonderful holiday destination for families of all ages, and for couples. Rental of Olive House can include the Apartment on the same estate free of charge for groups of 6 people.